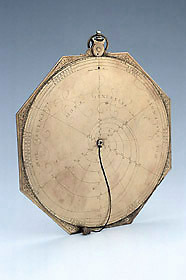 This dial consists of two superimposed plates, one octagonal and one circular. On the external side of the circular plate are engraved the hour lines in a spiral, numbered from 1 to 5 to 12. The increase and decrease of the declination of the sun is indicated by the inscriptions 'SOL ASCENDIT' and 'SOL DESCENDIT' and the hours by 'HORAE GENERALES'. In very small characters is the signature and date 'Erasmus Habermel Fecit 86'. On the border of the circle is a zodiac scale with the names of the zodiacal signs, divided to the degree, numbered from 10? to 30? by 10?. The corners of the octagonal plate are decorated with arabesques typical of Habermel, and at its bottom is a notch. This side carried the gnomon (missing) and a plumb line. On the other side of the dial is a diagram with common hours marked on the border from I to XII, I to XII, Italian and Babylonian hours numbered from 1 to 24 and a rotatable index for the conversion between them. In the centre is a wind rose, and the radial arm is engraved with the symbols of the zodiacal signs. The corners of the octagon carry the same arabesque decoration as on the other face. The dial has a suspension ring.